Black cottonwood (BC, Populus trichocarpa) and hybrid aspen (HA, P. tremula × tremuloides) differ in their ecology of being adapted to wet and drier conditions as riparian and early successional forest species, respectively. We tested the hypothesis that these ecological differences were reflected in higher nitrogen (N) use efficiency in HA than in BC and that HA would allocate more resources belowground than BC in the presence of high and low N availability. We expected that responses of wood properties to elevated N would be more pronounced in the species with higher wood formation in response to N supply. HA showed higher belowground biomass partitioning than BC in the presence of low (0.2 mM) and high (2 mM) N supply, but in contrast to our expectation whole-plant nitrogen use efficiency and the stem carbon-to-nitrogen balance were lower than in BC. In response to elevated N, HA exhibited stronger stimulation of biomass production than BC, especially of the stem, which showed significant increases in biomass and volume but decreases in density. Lignification, especially the production of guaiacyl (G)-compared to syringyl (S)-lignin, was delayed in HA compared with BC wood. Since G lignin leads to stronger crosslinking than S lignin, its delayed formation may have enabled stronger expansion and higher volume increment of HA than of BC stems. Our results suggest that BC, a poplar species adapted to fluctuating N supply, is less responsive to differences in N availability than aspen that occurs in low N environments. The online version of this article (doi: 10.1007/s00468-012-0761-0) contains supplementary material, which is available to authorized users. 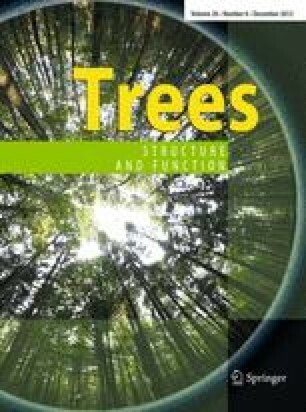 Fast growing poplar trees have been used for the generation of pulp, paper and wood products (Bradshaw et al. 2000; Taylor 2002) and are currently considered as an appealing resource for biofuel feedstock (Kintisch 2008). While most trees are adapted to habitats with low nitrogen (N) availability, tree species grown in floodplains and at river belts such as poplars are usually connected to permanent nutrient supply, with the water stream (Rennenberg et al. 2010) often containing high amounts of nitrate as the predominant N source (Gambrell et al. 1991). As cultivation of poplars on fertile land is no option in a world that needs to produce increasing amounts of food for a growing population, poplar biomass plantations will rather be constricted to marginal soils requiring fertilization for optimized biomass production. Many studies show that nitrogen stimulates poplar growth and biomass production (Coleman et al. 1998; Coleman et al. 2004; Cooke et al. 2005; Dong et al. 2004; Harvey and van den Driessche 1999). However, there is also evidence that growth stimulation by N fertilization is dependent on the poplar species and cultivar (DesRochers et al. 2006; Laureysens et al. 2004). For example, in a boreal climate, some poplar species (Populus balsamifera × P. simonii and P. deltoides × P. × petrowskyana) responded negatively to fertilization with ammonium nitrate (DesRochers et al. 2006). On a fertile site, fertilization had no benefit for hybrid aspen growth in the first 2 years (Hansen et al. 1988). Nitrogen fertilization enhanced hybrid poplar Populus deltoides Bartr. ex Marsh. stemwood production, but less so on a rich than on a poor site (Welham et al. 2007). These observations indicate that there is large variation in the N responsiveness in the genus Populus, whose basis is currently only poorly understood. There is now also emerging evidence that wood properties are influenced by N fertilization. For example, N fertilization resulted in increased vessel lumina and thinner cell walls in different poplar clones (P. × euramericana, P. nigra, P. alba; (Luo et al. 2005; Luo and Polle 2009). Larger vessel lumina and lower wood densities were also found in hybrid poplar (P. trichocarpa × deltoides) in response to N fertilization (Hacke et al. 2010). However, the fertilized P. trichocarpa × deltoides developed thicker cell walls—with a characteristic gelatinous layer—than non-fertilized hybrids (Pitre et al. 2010). Furthermore, species-related differences regarding the influence of N fertilization on fiber length (Luo et al. 2005; Pitre et al. 2007a), lignification and production of phenol-based compounds exist (Luo et al. 2005, 2008; Novaes et al. 2009; Pitre et al. 2007b). All these observations indicate that the influence of N on wood formation varies with poplar species. Therefore, genetic adaptation to N availability may play a key role in N partitioning for wood formation. To obtain further information on the links between wood properties and nitrogen use in poplar, we studied wood histochemistry and composition as well as nitrogen partitioning in two poplar species grown with low or high nitrogen supply. We selected black cottonwood (BC, P. trichocarpa and hybrid aspen (HA, P. tremula × P. tremuloides) for our investigation, because we expected that the ecological differences between these species may affect their nitrogen partitioning and growth properties. While poplars such as black cottonwood generally display fast growth rates owing to their adaptation to nutrient-rich environments in riparian ecosystems, aspens (P. tremuloides, P. tremula) are forest species adapted to lower nutrient availability and drier climatic conditions (Dickmann and Kuzovkina 2008). We hypothesized (1) that hybrid aspen would display lower N uptake, lower biomass production and higher nitrogen use efficiency than black cottonwood under low nitrogen conditions and (2) that a negative influence of high N availability exists on wood densities, N use and lignification in both species. Black cottonwood (Populus trichocarpa, Weser 6) and hybrid aspen (P. tremula × P. tremuloides, Münden) were multiplied by micropropagation in 1/2 MS including vitamins (Duchefa, Haarlem, The Netherlands) with 2 % sucrose and 0.7 % Agar Kobe I (Roth, Steinheim, Germany), pH 5.7–5.8, in an air-conditioned room (22 °C air temperature, 70 μmol photons m−2 s−1 of photosynthetic radiation, day/night lengths of 16/8 h). Microcuttings were rooted on medium containing 0.5 μM indole-3-butyric acid (Duchefa, Haarlem, The Netherlands). Rooted plantlets were transferred to soil in 0.1 L pots (Fruhstorfer Erde Typ T25, Industrieerdenwerk Erich Archut, Lauterbach/Fulda, Germany) and acclimatized to ambient greenhouse conditions. Plants with average height of 24 ± 6.15 cm were planted in 5 L pots (Fruhstorfer 0-Erde, Industrieerdenwerk Erich Archut, Lauterbach/Fulda, Germany) and grown for 11 weeks at ambient temperatures between 20 and 35 °C and additional light of 500–700 μE (depending on plant height) of photosynthetic radiation at canopy height (Osram Powerstar HQI-TS 250W/D UVS, Osram AG, Munich, Germany) for 15 h per day. The plants were fertilized once a week with Long-Ashton medium (Hewitt 1966) containing either 2 mM KNO3 for plants supplied with high nitrogen (N) or 0.2 mM KNO3 for plants supplied with low N, respectively. When the plants were about 80–100 cm tall, they were fertilized twice a week. They were harvested after 2.5 months of N treatment. Plant heights (h s) and stem diameters (d s) were recorded regularly. At the harvest, fresh leaf, stem, and fine and coarse root biomass were determined separately. Two to three centimeter-long basal stem segments were stored in FAE (2 % (v/v) formaldehyde, 5 % (v/v) acetic acid, 63 % (v/v) ethanol). Stems, leaves and roots were oven dried at 60 °C for 2 weeks and weighed. The root-to-shoot ratio was calculated as R/S = (dry mass of fine roots + coarse roots)/(dry mass of stem + leaves). The stem volume (V s) was estimated as: V s = b a × h s/3, where b a is basal area [=∏ (d s/2)²] and h s is height (Brown and van den Driessche 2005). Wood density was estimated as: P = W d/V s, where P is wood density and W d is the oven-dry weight of the stem (Stiller 2009). Dry plant tissues (stem taken from the 5th to the 8th internode, fully expanded leaves, fine roots and coarse roots) were milled to a fine powder (MM2 Retsch, Hannover, Germany). Aliquots of 0.7–0.9 mg were weighed (Sartorius Supermicro S4, Göttingen, Germany) into tin capsules (Hekatech, Wegberg, Germany) and analyzed in an Elemental Analyzer EA1108 (Carlo Erba Strumentazione, Rodano, Italy). Acetanilide (71.09 % C, 10.36 % N; Carlo Erba Strumentazione) was the standard. Nitrogen partitioning was calculated as: (N content of the plant tissue) × 100/(N content of the plant), where N content is N (mg/g dry mass) × dry mass of the tissue (g). The carbon-to-nitrogen balance was calculated as C/N = amount of carbon produced/unit of N taken up. At the whole-plant level, C/N corresponds to nitrogen use efficiency (NUE) (after (Vitousek 1982). Stem cross sections with 50-μm thickness were cut on a sliding microtome (Reichert-Jung, Heidelberg, Germany) from FAE-fixed stem segments. The cross sections were stained with Wiesner reagent (5.25 g phloroglucinol (1,3,5-trihydroxybenzol) dissolved in 350 ml of 95 % ethanol and 175 ml of concentrated HCl (25 %) for 3 min (Vallet et al. 1996), which is generally used to detect guaiacyl (G) lignin, but in fact stains cinnamyl aldehydes. Further sections were stained with Mäule reagent [2 % (w/v) potassium permanganate (KMnO4), 5 % HCl and 1 % NH3] to detect syringyl (S) lignin (Meshitsuka and Nakano 1978, 1979). Sections were viewed under a light microscope (Axioplan, Zeiss, Oberkochen, Germany) and photographed immediately with a digital camera (AxioCamMR3, Zeiss, Oberkochen, Germany) with 400-fold magnification. Lignin was measured with the acetyl bromide method in stem section harvested above the root collar after Brinkmann et al. (2002). FTIR-ATR spectra were recorded on the surface of peeled dry stem sections, which had been taken just below the stem section used for anatomical analysis. FTIR spectra were acquired with an FTIR spectrometer Equinox 55 (Bruker Optics, Ettlingen, Germany) combined with an ATR unit (DuraSamplIR, SensIR Europe, Warrington, Germany) at a resolution of 2 cm−1 for 32 scans in the range of 600–4,000 cm−1. Mean spectra from three different positions of the stem section were generated for each stem sample using software OPUS Version 5.0 (Bruker Optics, Ettlingen, Germany). The spectra for all samples were baseline corrected and vector normalized using software OPUS Version 5.0. Wavenumber assignments for lignin, protein and celluloses and hemicelluloses were taken from (Luo and Polle 2009) and used to determine compositional changes. Data are means of eight or five biological replicates (±SE). Significant differences between treatment means were determined using multiple comparisons of means (two-way ANOVA) by the software Origin Pro 8 (OriginLab Corporation, Northampton, USA). For principal component analysis (PCA), the first derivatives of the vector-normalized FTIR-ATR spectra were used with the wavenumber variables (resolution of 2 cm−1) from 1,352 to 1,309 cm−1 for S lignin and from 1,294 to 1,236 cm−1 for G lignin, respectively. The data were loaded into Statgraph Centurion (StatPoint Technologies Inc., Warrenton, VA) and PCAs were extracted by minimum eigenvalue. Whole-plant biomass production of black cottonwood (BC) and hybrid aspen (HA) was similar and responded positively to high nitrogen supply (Table 1). However, biomass partitioning between above- and belowground plant tissues differed strongly between the two species (Table 1). In HA, biomass was almost evenly distributed between above- and belowground, whereas BC produced more above- than belowground biomass (Table 1). In both species, high N supply resulted in preferential aboveground biomass production, shifting R/S to lower values (Table 1). Stem biomass and wood density were particularly sensitive to N and the response differed between HA and BC. BC formed almost twice the stem biomass of HA under low N. High N stimulated stem biomass production almost twice in HA, but only 1.3-fold in BC. Moreover, the stem volume of HA under high N was almost three times higher than under low N, resulting in a significant decrease in wood density (Table 1). The stem volume of BC was only 1.2-fold increased in response to N and the decrease in density was small compared to that of stem formed under low N (Table 1). To find out if the strong differences observed with respect to the N response in stem properties of HA and BC were related to species-inherent differences in N partitioning, we determined N in different plant tissues. HA accumulated relatively more N in roots and BC in leaves than the respective other species (Fig. 1). The relative N partitioning to the stem was unaffected by N supply and did not differ between species. The carbon to nitrogen (C/N) was determined as the amount of carbon per unit of N for the whole-plant level, where this measure corresponds to nitrogen use efficiency (NUE), as well as for different tissues (Table 2). Strong species-related effects were observed with HA generally showing lower NUE than BC (Table 2). High N supply resulted in the well-known reductions in NUE as the result of decreases in the C/N balance of all tissues with the exception of stems (Table 2). The mean lignin content of BC and HA was 18.3 ± 0.3 % without any significant differences between species or N treatments. However, histochemical analysis after phloroglucinol/HCl staining showed only faint pinkish staining of wood of HA supplied with high N (Fig. 2a, b). Under these conditions, mainly the cell walls around vessels and rays showed strong staining intensities. When the poplars were grown with low N supply, fiber cell walls were also stained (Fig. 2c, d). In contrast to phloroglucinol/HCl, Mäule staining resulted in relatively even coloration of wood regardless of species or N treatment (Fig. 2e–h). This suggests that high N supply influenced lignin composition. To corroborate these observations, FTIR spectra were acquired at the surface of peeled, dry stem wood. This prevented changes in wood compositions due to milling and ensured that only recently formed young wood was analyzed. Mean spectra in the fingerprint region of wavenumbers from 1,800 to 800 cm−1 revealed profound differences of wood from BC and HA and also showed that N influenced wood components, especially in the wavenumber region between 1,750 and 1,500 cm−1 (Fig. 3). In comparison to BC and high N treatment, wood of HA produced under low N supply displayed a higher peak at 1,738 cm−1, which has previously been assigned to xylan acetates (hemicellulose, (Müller et al. 2008) and another peak at 1,650 cm−1, which is indicative for proteins (Nelson 1991; Williams and Fleming 1996). Notably, wood of BC from low N showed a relatively high peak at this wavenumber, thus supporting differences in N utilization in wood of both poplar species (Fig. 3). The lignin peak at 1,510 cm−1 (Ferraz et al. 2000) was clearly discernible in HA wood from low nitrogen (Fig. 3), whereas it was superimposed by the absorbance of other, apparently N-responsive components in wood of HA grown with high N supply as well as in wood of BC regardless of N nutrition. Peak ratios of the FTIR spectra indicated that HA wood from low N was enriched in lignin relative to protein and polysaccharides (Table 3). The wavenumber 1,316 cm−1 has been assigned to S lignin (Brunow 2001) and those at 1,270 cm−1 (Evans 1991; Pandey and Pitman 2003) and 1,140 cm−1 (Faix 1991) assigned to G lignin. The ratios of the wavenumbers 1,316–1,270 and 1,316–1,140 showed significant increases in S relative to G lignin in wood of poplars grown with high N and stronger responses of this ratio to N in HA than in BC (Table 3). PCA analyses were conducted of the FTIR spectral regions 1,352–1,310 cm−1 (Fig. 4a) and 1,294–1,236 cm−1 (Fig. 4b) representing S lignin and G lignin, respectively. The analysis for both S and G lignin yielded three main components. In S lignin range, HAH samples were mainly separated from HAL samples by the second component (23.9 % of the variation, Fig. 4a). In the G lignin range, HAL samples (with one exception) were separated by the first (59.1 % of the variation) and the second component (30.1 % of the variation) from all other samples (Fig. 4b). The third component contributed 7.6 and 6.1 % to the variation in the S and G lignin wavenumber ranges, respectively. Poplars and aspen differ in their ecological requirements because they colonize different habitats (Mitton and Grant 1996; Rood et al. 2003). HA is a hybrid originating from the closely related European and American aspens, which are generally adapted to drier conditions than BC. Indeed, aspens were more cavitation resistant than poplars (Schreiber et al. 2011). According to our expectation, HA partitioned significantly more biomass belowground than BC, which grows along rivers (Rood et al. 2003). Preferential resource allocation to root formation is favorable to cope with drought stress (Breda et al. 2006), but may result in trade-off with respect to the production of woody biomass. This was observed here since HA grown with low N availability produced only about half of the stem biomass as BC. Unexpectedly, HA was highly sensitive to increased N availability and showed more drastic growth increments than BC. Currently, we can only speculate about the reasons: there is evidence that N starvation results in up-regulation of N uptake systems, which decrease upon long-term exposure to elevated N (Gessler et al. 2004). Our results suggest that this regulation may be less effective in HA than in BC, because HA did not only show growth stimulation but also profound decreases in NUE because carbon productivity did not match N accumulation. The present study has been conducted with young poplar and aspen plants under controlled conditions and therefore needs to be interpreted with caution. Still, it is notable that BC was little responsive to N fertilization. Poplar clones grown for several years on an agricultural field also revealed little growth stimulation in response to N fertilization (Gielen et al. 2005; Liberloo et al. 2006; Luo and Polle 2009). Remarkably, N fertilization of HA caused similar stem biomass production as in BC, while maintaining high root production and high root-to-shoot ratios at the same time. Previous studies with black cottonwood hybrids revealed that N-induced growth stimulation resulted in increased expression of aquaporin indicating increased demand for water (Hacke et al. 2010). It will also be important to test the water requirement of HA in future studies, because higher wood production in combination with high root biomass may be advantageous compared with BC under fluctuating climatic conditions. Although the lignin content of poplars may vary within a considerable range (Zhou et al. 2011), no differences were found here between BC and HA. N availability alters the expression of genes, which modulate the partitioning of C and N resources into wood (Cooke et al. 2003, 2005; Pitre et al. 2010). In some studies, the total amount of lignin decreased in response to N fertilization, because more carbon was partitioned into cellulose and growth was stimulated (Novaes et al. 2009; Pitre et al. 2007a). Those results suggest that lignin and growth may be negatively correlated. However, in our study, the total lignin concentration was unaffected by higher N supply in both BC and HA, in contrast to the previous suggestion. Other recent studies have also shown that lignin or phenolics were not decreased in response to N fertilization (Harding et al. 2009; Luo et al. 2008). The finding that the lignin concentration in HA and BC were unaffected by N fertilization was surprising, since the histochemical staining suggested decreases in G lignin under high N levels in HA wood. Populus trichocarpa × Populus deltoides also showed decreased G lignin staining, but unaltered total lignin concentrations in response to high N treatment (1 and 10 mM NH4NO3, Pitre et al. 2007b). In both studies, young wood was used for staining, whereas the lignin concentrations were determined for whole-stem wood. 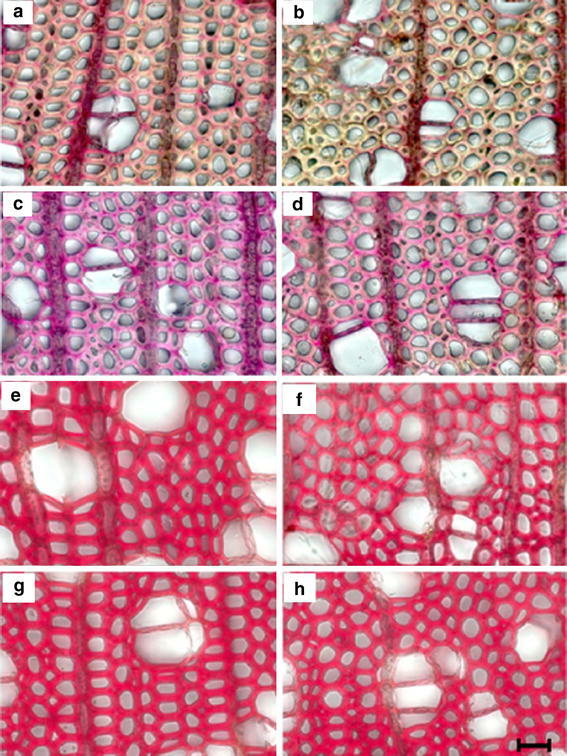 If the rate of cellulose deposition into secondary cell walls was accelerated under high N availability, but not that of lignin formation, a reduction in lignin content in young wood cells is expected. As the maturation of wood cells continues, normal lignin concentrations will be deposited. Therefore, it is possible that the overall lignin concentration is stable despite apparent reductions in the walls of young cells. Pitre et al. (2007b) claim changes in the S/G ratio with increases in G lignin under elevated N availability; however, the observed changes were small and not subjected to statistical analyses. Our FTIR analysis, which enabled us to make measurements on young developing xylem, corroborated changes in lignin composition, especially in young wood of HA. PCA analysis clearly revealed that N fertilization caused strong differences in lignin composition in the developing HA wood compared to that of BC with regard to G lignin. G lignin is mainly deposited in the middle lamella and primary wall areas (Meshitsuka and Nakano 1985). More G than S units were detected in cambial tissues (Christiernin 2006). These findings indicate that G lignin is deposited at very early stages of xylem formation. Apparently, in HA, which showed massive N-induced growth stimulation of the stem, less G lignin is formed during the initial stages of wood formation. Analysis of transgenic poplars revealed that reductions in G lignin resulted in less condensed 5–5 inter-unit linkages, higher cellulose contents and improved pulping properties (Li et al. 2003; Pilate et al. 2002). Whether the observed shift in the S/G ratio in young wood of N-fertilized HA affected vessel extensibility and thereby was a causal factor for its decreased wood density are currently speculative. The wood densities of BC and HA grown with low N supply were similar to those of other poplar species grown under field conditions (≈0.56 g cm−3, (Tamm 2006), whereas N fertilization caused a specific and significant decrease in aspen wood. Our study corroborates strong differences in N partitioning and utilization in BC and HA, which correspond to different ecological strategies of these species. However, in contrast to our working hypothesis that BC would be sensitive to low N supply because of its adaptation to high N supply with the through-flow of rivers, and vice versa that HA would be less responsive to high N because of growth on N-limited sites, BC showed moderate and HA strong responses to high N availability. These differences might have been the result of adaptation to fluctuating N concentrations experienced by BC and adaptation to low N environments, which may have required evolution of highly efficient N uptake systems by HA. This might have caused the strong responsiveness of biomass formation and low NUE of HA to high N availability. High N supply affected wood properties of HA much stronger than those of BC resulting in a reduction of G lignin in young wood and severe decreases in wood density. As these changes are likely to improve the pulping properties and the performance under drought stress, future studies are needed to investigate the molecular physiology of N utilization in the context of the ecological adaptation strategies of different poplar species. We are grateful to the German Academic Exchange Service (DAAD) for a PhD scholarship to D.E., to the Fachagentur für nachwachsende Rohstoffe (FKZ 22004105, BMVEL, Germany), the BMBF (project BEST, Nachhaltige Landnutzung) and the European Commission within the Seventh Framework Program for Research, Project Energypoplar (FP7-211917) for financial support to parts of this study. We thank Sarah Manz for help with plant production and maintenance.